The 18th District Baseball and Softball Tournaments are set for May 18-19 at Hart County High School. The top-seeded Hawks will compete 6 p.m. May 18 against fourth-seed Caverna. Following that game, about 8 p.m., the second-seeded Lady Hawks will take on third-seeded Hart County. The baseball championship game will be 6:30 p.m. Tuesday, May 19. The softball championship game will be at 7 that evening. For many of us, finding our niche in a particular task takes a long time. Some of us find it early in life, while others find it later. I am always seeking out students who are not involved in activities to consider giving a sport a try in hopes they will find their niche. Most of the time I point them in the direction of track, simply because there are 14 events in which kids have an opportunity to excel. 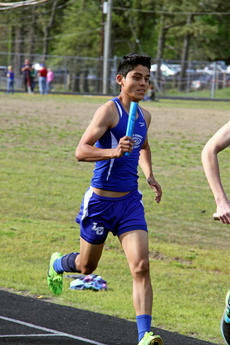 For Saul Marin, a freshman at LaRue County High School, it appears he has found his niche in track. The Lady Hawks blanked Hopkinsville, 5-0, Saturday in the Abe Lincoln Classic. Senior Emillee Cundiff struck out seven for the host Lady Hawks who improved their record to 16-13. She allowed one hit and two walks in seven innings. 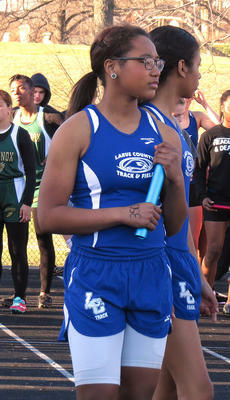 Sophomore Kourtnee Davenport went 3-for-4 with two RBIs, while sophomore Chasity Bryant added two singles and a run. 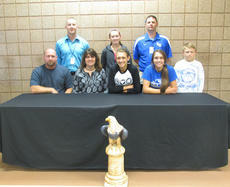 The LaRue County Hawks took two years of frustration out on the Green County Dragons. The Hawks claimed the top spot for the 18th District Tournament for the first time since 2012 with a 14-1 pounding of rival Green County on Saturday afternoon. It was LaRue County’s first sweep of the Dragons since 2012 when it last won the district title. MUNFORDVILLE — Nothing is better for a team than controlling its own destiny and the LaRue County Hawks are in that position. 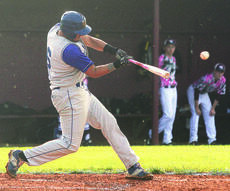 LaRue County freshman Jaxon Boley shut the Hart County Raiders down and the Hawks scored five runs in the final four innings to pull away for a 6-0 victory in an 18th District game Tuesday evening at Raider Field. The Hawks gave Coach Eric Allen a good birthday present, the program’s first 20-win season in his three-year tenure. It’s a big stepping stone for a young team coming off a 10-23 season. 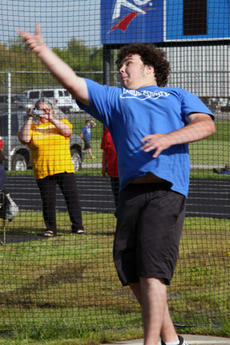 Junior Norman Sanders throws the shotput for the LaRue County High School Track and Field team. The Hawks picked up three wins in two days, running their winning streak to 12 by beating Grayson County, 5-3 on Tuesday, April 28 and sweeping an April 27 doubleheader with 18th District rival Caverna. * Junior Colby Skaggs scored on a fielder’s choice and freshman Brandon Cecil scored on a sacrifice to lift LaRue County past the Cougars (15-7). Sophomore Cameron Dawson hit a three-run homer in the third, giving the Hawks a 3-0 lead. Grayson County tied it in the fourth.